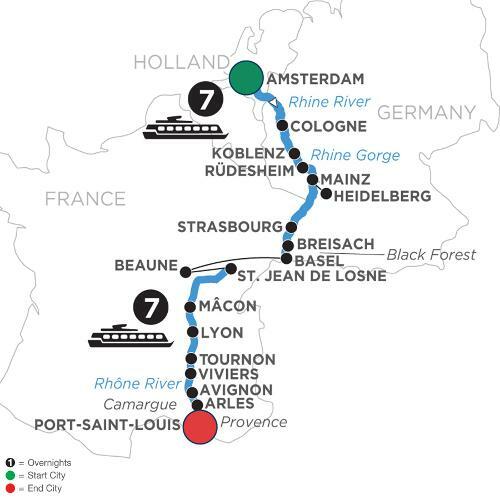 Immerse yourself in French and German culture on this fabulous Europe river cruise vacation along the Rhine, Saône, and Rhône Rivers. The views will be spectacular so be sure to pack your camera so you can capture the romance and splendor of this magical journey. It all begins in Holland’s popular, modern capital of Amsterdam. The best way to see the treasures of this 700-year-old city is on a canal cruise along the elegant Grachten. Cologne, Germany—a 2,000-year-old city best known for its gothic architecture and famous twin-spired cathedral, comes alive on a guided walk. Sail through the dramatic Rhine Gorge, the most beautiful stretch of the Rhine River dotted every mile with ancient castles. Strasbourg, France, located on the French-German border, perfectly blends the cultures of both countries. Stop in Breisach, Germany, the gateway to Germany’s Black Forest—an area of unrivaled natural beauty. Lyon is a showcase of medieval and Renaissance architecture. Explore the Old Town, a UNESCO World Heritage Site, with its maze of medieval alleyways. Continue to the city of Tournon beautifully nestled among vineyards. Here, you’ll go on a guided walk of this medieval treasure with Roman ruins and a fascinating 16th-century castle. In Avignon, visit the Palace of the Popes and take pictures of the bridge in the famous song “Sur le pont d’Avignon.” This remarkable river cruise will take you to Arles, the capital of the Provence region and famous for its 1st-century Roman Amphitheater. Your European river cruise on three beautiful rivers—the Rhine, Saône, and Rhône Rivers—will carry on in your favorite travel memories for a long time to come.